WBEA has set up a portable air monitoring station (AMS 101) in the community of Conklin. AMS 101 is parked at Wendy Tremblay’s house and will be in the community from May – August. This is a follow up to the monitoring that WBEA did in Conklin in 2009, and AMS 101 is now gathering more information about baseline air quality in Conklin so that comparisons can be made, and any future changes in air quality can be detected. AMS 101 measures Sulphur Dioxide, Hydrogen Sulphide, Total Hydro Carbon, Nitrogen Dioxide, Particulate Matter 2.5, Ozone, wind speed, wind direction, temperature and relative humidity. All of the measurements can be viewed at the following link on our website: http://wbea.org/monitoring-stations-aamp-data/historical-monitoring-data-mainmenu-224. Use the drop down menu and select ‘Portable Monitoring Unit (Conklin) – AMS 101’. From here you can choose the dates and times that you would like to view. A summary of the air measurements will be posted on the WBEA website at the end of August. 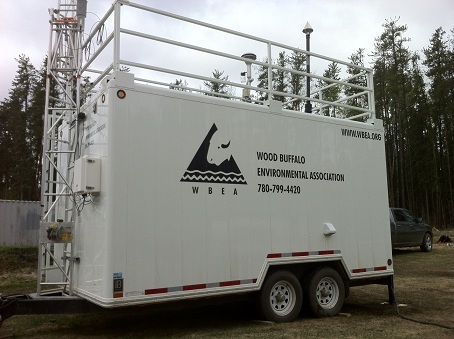 Please call 780-799-4420 if you have any questions about the portable unit, or about where to find the data.